Projecta’s three channel sequential charger maintains up to three batteries. PROJECTA's new range of MW battery chargers, available from Brown & Watson , incorporates computer programs known as c’Logix and Recovery Plus, that simplify the charging of today's range of battery types. The MW (Micro Processor Controlled Unit) utilises a multi bit microprocessor called c'Logix which has been pre-programmed to charge and maintain the wide variety of batteries being used in today's commercial and industrial situations. The c'Logix determines the exact charge required and maintains the charged battery at 13.5V, typical stand-by storage voltage, until it is required for work. This ensures good performance and reliability from plant and equipment. Part of the maintenance program is the periodical restart which prevents electrolyte stratification and sulphation. "c'Logix has been designed to deliver a constant current until the pre-programmed voltage is achieved,” George Davies, sales and marketing manager, said. These workshop chargers have been developed to charge and maintain various types of batteries including, calcium, lead acid, sealed lead acid, deep cycle, maintenance free, gel, dry cell and AGM batteries. The chargers are suitable for agricultural, marine, industrial stand-by plants, mobility scooters and 4WDs as well as the traditional automotive market. The four new models in the 'Projecta Workshop' range all feature constant current, multi-stage charging. The 12V models are rated at 4.5A, 14A with three outputs and 15A while the dual voltage at 15A (12V) and 7.5A (24V). The 12V 4.5A and 12V 15A chargers incorporate Recovery Plus. Heavily discharged or sulphated batteries are difficult to charge using conventional charging methods. These batteries have built up a huge internal resistance that normal charging will not break through. Projecta workshop chargers incorporating Recovery Plus will immediately sense when batteries are in this state and adjust their charging algorithm to smash through this resistance, delivering the charge that will allow a battery that may have been discarded, to be bought back into serviceable condition. 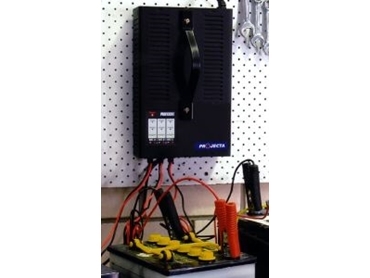 Projecta's three channel sequential charger charges and maintains up to three 12V batteries. These batteries can vary in size and type as c'Logix will automatically qualify each battery prior to its charging cycle. Reverse polarity, short circuit protection and spark free connection are features of all Projecta workshop models and an easy to follow LED display indicates every step of the charging algorithm. The new compact design incorporates an energy saving Toroidal transformer. All chargers can be bench or wall mounted.